Up against the invincible: A professor was convicted of sexual misconduct. Why is he still on campus? Women speak up. A tenured professor is accused of sexual misconduct. Who does the University protect? As professors field increasing public criticism for allegations of sexual misconduct, many demand fundamental shifts within the culture of academia. Often, the consequences—which rarely include the permanent removal of a faculty—fall short in their response to the pervasive nature of discrimination. Columbia, amid this intensifying scrutiny, has found itself at the center of the conversation, with an influx of lawsuits, investigations, and allegations in the last few years. But while dramatic headlines provoke condemnation of the University, Columbia has never in its history formally dismissed a tenured faculty member who has been convicted of sexual misconduct, assault, or harassment, University President Lee Bollinger told Spectator in an interview last October. All the tenured professors in this article, in fact, retained access to campus long after being found guilty or settling with Columbia. According to a lawsuit filed by Jane Doe against former history and classics professor William Harris, he kissed and groped her repeatedly and denigrated her to their colleagues after she refused his advances. But although he reached a settlement with the University and retired nearly two years ago, Harris is still permitted access to campus, and in particular, to spaces within Butler Library where classics students often work, Spectator has found. He still lives in his Columbia-owned faculty apartment. Last March, after Columbia found prominent neuroscientist and professor Thomas Jessell guilty of sexual misconduct for engaging in an illicit, years-long relationship with a lab member under his supervision, the University announced that Jessell would be removed from all administrative posts. The Howard Hughes Medical Institute, one of the nation’s largest private funding organizations for medical research, stripped Jessell of his titles and grants and cut funding from his lab. At least eight months later, however, Jessell remained on campus working with students and using research facilities, according to multiple MBBI researchers. And in a case previously undisclosed, English professor Michael Golston was found responsible in July 2018 for sexually assaulting and harassing a student, according to documents from an investigation conducted by Columbia’s Office of Equal Opportunity and Affirmative Action. But almost a year later, the University has given no official update regarding his teaching status or access to campus to either the complainant or the chair of his department. 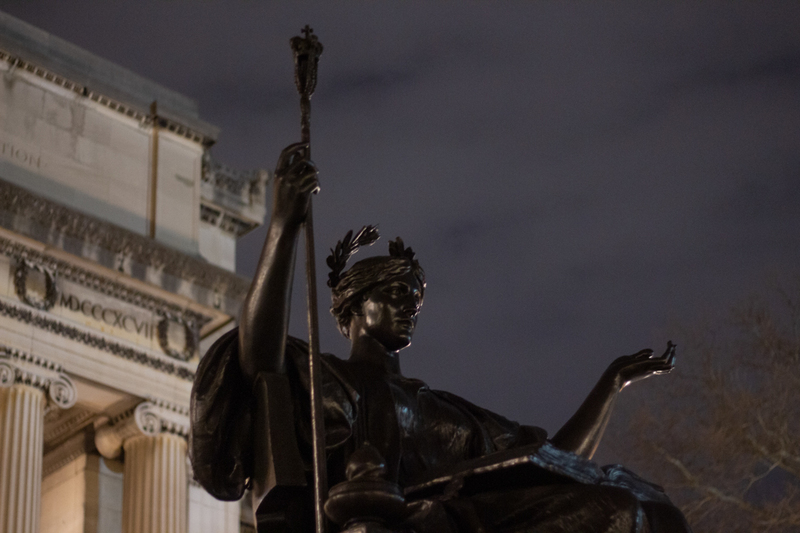 In a statement to Spectator, a University spokesperson emphasized that issues of tenure do not interfere with Columbia’s priority of campus safety. “Tenure does not prevent the University from meeting the needs of our students or ensuring that Columbia remains a safe and welcoming environment for all. Indeed, in cases where faculty members have been found responsible for policy violations in this area, the University has acted decisively to remove those faculty from the classroom and to restrict their interactions with students,” the statement said. If the University were to formally strip faculty of the right to campus, it must undergo a lengthy hearing process akin to a formal court trial, involving witnesses, a faculty jury, and multiple rounds of review that include the president and board of trustees. But in lieu of these proceedings, Columbia cannot force a tenured professor to stop teaching, bar them from facilities, nor revoke their housing, putting the onus on the complainant to avoid the alleged perpetrator—unless the faculty member consents to surrender rights to which they are contractually entitled. “There are extremely strong protections for tenure. … You cannot remove or deny a faculty member the rights of tenure without going through a process that is basically a trial, something that is so difficult in many ways that it’s never been used,” Bollinger said. Through an analysis of court records and interviews with those involved, Spectator has conducted a yearlong investigation into four separate, high-profile cases in which a nontenured faculty or student accused a tenured faculty of sexual misconduct, ranging from a violation of consensual relationship policies to sexual assault. The conclusion of these cases saw faculty renounce the right to teach, convicted of what they were accused, or felled in the court of public opinion. Outside of the spotlight, each case reveals a university greatly limited by the clash between two conflicting systems, operating under an existing framework that poses a legal minefield and leaves complainants feeling powerless and uncertain about what rights they possess. In an effort to find a solution, Columbia may work with private organizations to achieve resolution through informal means, typically in the form of mediation and negotiation, that skirt both federal and state judicial systems as well as internal university policies. But this negotiation process grants the accused faculty significant power to argue the terms of their settlement, and is also often opaque—even to those involved directly in the proceedings. “I feel confident in the handling, the outcomes of the cases that we have dealt with. But I am questioning whether the process we have to follow to get there is the best from the institution’s standpoint,” Bollinger told Spectator in a later interview in February. In light of allegations, the Columbia community has expressed a widespread skepticism regarding the capacity of the University to respond adequately. Claiming to be paralyzed when faced with tenure protections, administrators and faculty charged with responding to sexual misconduct ask a seemingly simple but fundamentally complex question: What can we do to help? Due to lack of transparency from the University, interviews show that faculty and department chairs—often the first lines of response—remain largely unaware of what happens after a complaint is filed against a tenured faculty member, and thus lack knowledge needed to help students navigate the system. Assuming that nothing could elicit an effective response, faculty and administrators may at times even discourage those who wish to come forward from filing official complaints. And in the face of legal action, administrators may also retract disciplinary measures against tenured faculty members that they originally proposed, Spectator’s investigation has found. “Sometimes [administrators’] hands are tied; [they] have to work through laborious, complex drawn out processes. And sometimes this takes months and years, and many times universities may not get to where they—and others—thought they would,” Julian Williams, expert and former Title IX coordinator at Vassar College, said. In examining an institution’s response to allegations brought against tenured faculty, one pattern becomes clear: Sexual misconduct pervades higher education because the structures intended to address it are either broken, muddled in bureaucracy and legal boundaries, or fail to exist at all. Continue reading Part 1, where we dive into how faculty and administrators respond when allegations against tenured faculty first arise. Senior staff writer Khadija Hussain can be contacted at khadija.hussain@columbiaspectator.com. Follow her on Twitter @hussainkhadijaa.